The socks for #1 Son are on the needles now. They’re in Meilenweit Cotton Fantasy #801. He really wanted something in seafoam green, but I just couldn’t find any yarn I liked in that color. He has declared that this will be “cute” and he likes the colors. I’m keeping my fingers crossed. Taking a hint from Queen Kahuna’s Crazy Toes And Heels book I’ve done the toe in Eye of Partridge to add reinforcing. 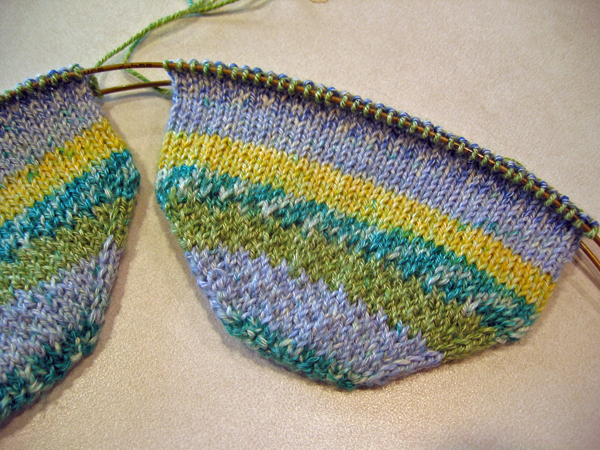 I’ll do the heel in the same stitch. On the blog front, I’m working on a total redesign of PI. I was going to just do a new skin, but I decided that it was time to bite the bullet and really use the new template setup in WordPress 1.5. The new look will be sort of 50’s retro in rather subdued colors. I’m hoping to get the rework done and published some time this weekend — if life doesn’t get in the way of blogging.